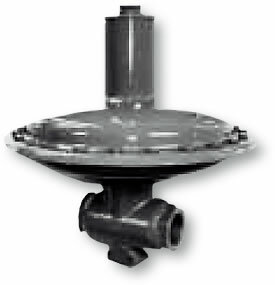 The RB 1700 is a direct-acting, spring-loaded regulator; the balanced valve design ensures a constant outlet pressure when the upstream pressure varies, eliminating the need for orifice size changes arising from the different inlet pressure ranges. The RB 1700 Regulator is designed for commercial applications, including industrial boilers and furnaces, appliance pressure regulation, secondary regulation of plant distribution piping, and all installations with continuous consumption and rapid flow rate variations, such as burners, industrial ovens, boilers, etc. The RB1700 employs a direct-acting spring-loaded design that allows for extremely fast response as well as reliable closure during no-load conditions. As downstream demand increases, the downstream pressure begins to fall, which, in turn causes the sensing line pressure and the pressure under the main diaphragm to decrease. When the pressure under the main diaphragm drops, the spring force is able to move the diaphragm downward and, thus, the main valve further open to meet the increased demand.